Around the year 1650 A.D. the word highwaymen entered our language. It referred to robbery committed on a public road against travelers. Now we use the phrase “highway robbery” for which we pay the tolls to travel on modern day roads. The highwaymen alas are among us and we have elected them. At such times it would not take much more in the destruction of mining equities to make investors feel as if they have been seduced by sweet talk and abandoned to the wolves of Wall Street by latter day highwaymen. Simply put it has been one in which the elites have shrugged their collective soldiers, leaving the rest of us bewitched, bothered and bewildered. There are no safe havens unless one reaches for the carrot dangled on a stick in the form of treasuries (TLT) and dollar bills (UUP). It is as if investors who have played the game fairly are uneasily realizing they have been dealt a series of sucker blows from the elites who in essence have fixed the game. 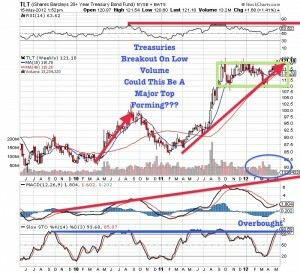 Investors believe that treasuries and cash will protect their capital. This may be a conclusion founded on quicksand. Many investors could face significant losses should yields rise in the U.S. as it has done in Europe. Due to the volatility in the global equity markets, investors have maxed out their portfolio holdings in cash and U.S. treasuries. If bond prices drop resulting in rising yields we could see a mass flight out of bonds into the oversold commodities (DBC) and miners (GDX) which are trading at a record discount to the global equity market. 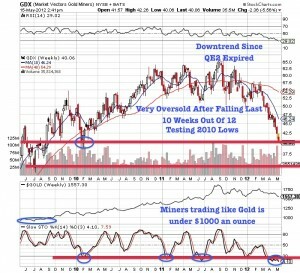 How can so called experts call a gold bubble (GLD) when gold equities are trading at historically cheap valuations? Could it be that the real bubble is in the U.S. Treasury market where investors are actually receiving negative returns? A growing fear of the financial system is increasing similar to 1933 when FDR was elected. Fears that FDR would devalue the currency caused a bank run where investors withdrew their cash to buy gold. Could something similar be brewing in Europe with the election of Hollande in France and Greece threatening to leave the Euro? We learn that our elected U.S. officials have indulged in profiting from insider trading for which we citizens could have done hard time. Imagine buying VISA for $46 and the next day making a handsome profit at $64 on 5 million shares. This actually happened and continues to occur as a matter of lifestyle for our elected officials. Then there is the chutzpah of Freddie Mac and Fannie Mae coming before the public requesting $1.8 million dollars for a Christmas Bonus for non performance and downright destruction of a major mortgage institution. Then there is the $191 million dollar loss in MF Global trading European Government Bonds. There is still $1.6 billion of client’s money missing. Then we have the wife of Switzerland’s central bank chief who went long the U.S. dollar right before he imposed a cap on the Swiss franc. Similarly we had the $2 billion+ carnage experienced by JP Morgan and Jamie Dimon. Here we have a team of the best and brightest minds on Wall St. screwing up gloriously trying to time the short term. This may be a cautionary tale for those who try to play the markets in the short term particularly in the arena of wealth in the earth assets where long term stratagems pay off in hundreds of percentage points. The MF Global and JP Morgan (JPM) debacle may be adding to the volatility of the sell off in commodities and mining equities as they may have had to cover their bad bets in European Sovereign Debt. WIth the market covered with crimson yesterday it might appear that our natural resource selections in gold, silver (SIL) rare earths (REMX) and uranium (URA) miners are a thin blanket for a cold night. Since when has wealth in the earth not experienced breathtaking corrections as they continue in their upward trajectories? Remember there may have been selling to satisfy a deluge of margin calls. It is folly to look at the day to day gyrations of our wealth in the earth selections. There are those critics who might question the absence of risk management in precious metal selections. They miss the basic point completely. Play that game with miners at your own risk. Just as swiftly as they go down, so is the consequent upside. Investing in resource stocks is a risky game. Only the most disciplined market participants can manage to play the swings profitably. So hold on for what has been this tumultuous ride. The markets are swept by waves of fear and distrust of the Western Capitalist System. Delayed until 2012-2013 will avail us little except postponement of the inevitable. What was really needed was a plan of attack to bring our debt levels down. One would’ve thought that our well payed solons could have come up with a better solution. Instead, they will be forced to monetize the debt and pay it off with cheap dollars. Sooner or later, this is eventually a win-win situation for investors in precious metals and tangible assets. Do not underestimate the intelligence of the investor. Are our elected representatives waiting for a Tahir Square to take place on American and European Streets? It is growing late in the game. The Iranian situation which we continue to highlight is simmering to a boil. The United States and its allies Britain and Canada are using the outmoded tactic of gunboat diplomacy to wag warning fingers at an Iran that ignores us and grows stronger everyday. Is this not an admission by the West that they lack the financial wherewithal to undertake another military expedition? This is all part in parcel of the disintegrating situation which lack of leadership and American resolve has brought us. Are we facing the stark reality that the Emperor-America has no clothes? Hopefully, this is not the case. But the markets are speaking differently. Thus the disconnect between mining equities and bullion. Now the clarion call is “cash is king” as the herd rushes for what seems to be the latest safe haven fad. Of course the mouse thinks that the cheese will always be there, not realizing that it is the bait in what may be a fiscal trap. Ergo where do our subscribers go from here? The answer may be what it has always been from the days of Babylon to the present…wealth in the earth natural resources which are fungible into food, clothing and shelter.